From reducing waste at Emory Athletics games to building a "living wall" in the heart of first-year student housing, winners of this year's Incentives Fund grants have diverse plans to further green goals on campus. They were honored recently at a luncheon at Cox Hall. This fall, the Office of Sustainability Initiatives (OSI) opened applications for small grants through the Incentives Fund, an opportunity that has been in place since 2007 to drive innovative, sustainable projects on campus. Proposals were submitted in October and were reviewed by a committee of students, faculty and staff engaged with sustainability programs and practices on campus. 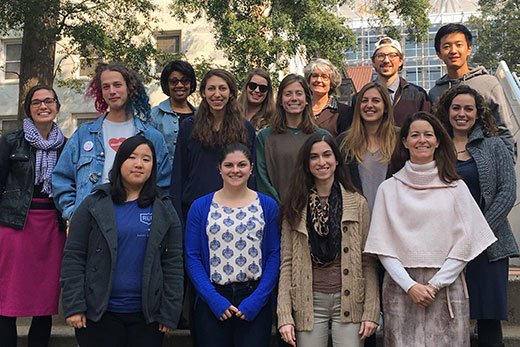 The general Sustainability Incentives Fund allows students, faculty and staff of Emory University and Emory Healthcare to request up to $3,000 to complete a project that would make Emory a "greener" place. The Green Offices Incentives Fund and Green Labs Incentives Fund, both only in their second application cycle, award up to $5,000 toward changing behaviors and practices in certified office and lab settings. Incentives funds allow Emory’s offices and labs to offset the cost difference between conventional and more sustainable options. Last year, approved projects included testing sustainable practices for reusing or recycling petri dishes and pipet tips, the implementation of rechargeable battery systems in offices, and an electricity-generating bike in the spin studio at the Woodruff PE Center. Installing Motion Sensors in the Miller Ward Alumni House (Team leader – Alison Agnew): Add motion sensors to the four public restrooms in this heavily trafficked building to reduce energy use when the rooms are not in use. Emory University Orthopaedics and Spine Hospital (EUOSH) and Emory University Hospital (EUH) Garden Enhancements (Team leader – Michael Bacha): Increase the nutrient value and improve plant productivity of the garden soil at the EUOSH and EUH gardens by using organic compost and soil testing. Produce grown in the gardens is utilized for patient meals. Emory Lexicon of Sustainability (Team leader – Claire Barnes): Create a series of images and words that explain and show various themes of sustainable food production and consumption by Slow Food Emory, leading on-campus activities and off-campus excursions for students to create these images together. Emory Climate Week 2017 (Team leaders – Zola Berger-Schmitz, Clara Perez, Jennifer Fundora): Support for an environmental justice panel, a Wonderful Wednesday table and event, and for a film screening, which will all engage Emory community members in discussions about climate change and climate action. Sustainable Game Day Events (Team leader – Megan Campbell): Foster a culture of sustainability amongst Emory athletes, coaches and fans by making game days certified sustainable events that highlight the commitment of Emory Athletics to reducing waste. Eagle Row Community Garden Expansions (Team leader – Karly Hampshire): Adding a rain barrel and row of apple trees to the Eagle Row Community Educational Garden near the tennis courts on campus. Bike Parts for the Fixie (Team leaders – Benjamin Kasavan and Andriana Miljanic): Purchase more bike parts for the free bike repair shop on campus, which is open to all Emory students who need help repairing their bikes. Revitalize the Emory Forest (Team leader – Jamie Nadler): Continue restoring the understory in the forested area behind the Math & Sciences building on Oxford Road. Math & Sciences Center Green Roof (Team leader – Rebecca Park): Reseed the green roof on the Math & Sciences building and expand education and awareness-raising activities and signage to connect more of the Emory community with the installation. Residence Life and Housing: Workspace Additions for a Lively, Leafy Environment (Team leader – Tyler Stern): Integrate indoor plants into the Residence Life office to improve indoor air quality, human health and comfort in the office. Living Wall System Outside of Hamilton E. Holmes Hall (Team leader – Wenhao Sun): Reduce the energy consumption of Hamilton E. Holmes Residence Hall by implementing a living wall system outside the south-facing lounges while providing an aesthetic and educational element in the heart of Emory’s first-year student housing area. Enhanced Waste Signage at the James B. Williams School of Medicine Building (Team leader – Aaron Wallace): Install shadow boxes in four locations in the building which clearly show what materials should be disposed of in the recycling, composting and landfill streams.